Can't I just install my own granite countertops? No. 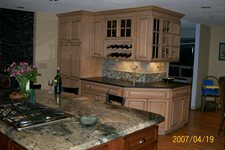 It takes years of working with granite to perfect the skill. Its not as simple as buying some tools from Home Depot and making it a weekend project. We use very specialized tools to cut, and polish your granite to ensure it fits correctly. This is a job that should only be undertaken by an experienced professional.